Steve Puntolillo is the owner and driving force behind the creation and evolution of Sonicraft A2DX Lab, which was designed to meet a specific need in the professional audio community: provide the ultimate multitrack analog-to-digital transfer service. Steve was born with the Sonicraft A2DX Lab in his DNA. He started experimenting with tape recorders in grade school, learned how to restore machinery in his family's business, taped bands and discovered NY recording studios in his teens and played on his first recording session (a demo for Rupert Holmes) before he learned to drive. As a young adult, he learned the recording business working freelance as a musician, engineer and tech in NYC and NJ recording studios, eventually partnering up to build and operate his own. Then, after selling his interest in the studio, he took an abrupt turn into the personal computer revolution, teaching himself how to program, troubleshoot and integrate computer graphic workstations. And then, coming full circle, he succumbed to the irresistible prospect of merging what he had learned about computers with what he knew about audio. Sonicraft was born. 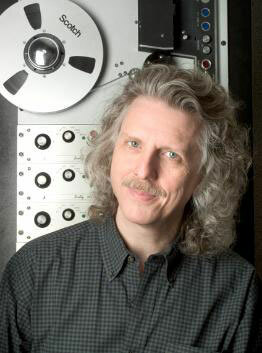 Since then, Steve has mastered over 100 commercial CD projects for Warner Chappell Music, Mode Records, Koch Entertainment, and many others, mixed and mastered several 5.1 surround projects for Mode, and mastered almost 60 Elektra music videos for broadcast on MTV and BET, as well as distribution on VHS and DVD including projects for Metallica, Bjork, Missy Elliott, Staind, Third Eye Blind, Nine Inch Nails, The Cure, Smashmouth and Natalie Merchant. In Y2K, a disastrous experience with having a multitrack transfer done made it clear that there was a need for a dedicated state-of-the-art transfer lab. But, what would it take to do it right? To answer this question, Steve enlisted the help and guidance of more than a dozen industry experts and dove headlong into innumerable hours of vintage tape machine restoration and tireless experimentation, leaving no stone unturned in what became a quest to provide the ultimate in open reel analog to digital transfers across the entire range of analog tape formats. Today, Sonicraft A2DX Lab enjoys a transfer system believed to be the best on the planet, and a passionately appreciative clientele of artists, songwriters, music content owners, music producers, recording engineers, mastering engineers, recording studio managers, artist foundations and record labels. Steve can be reached at: steve@sonicraft.com or (732) 303-8559. Do you have content or pictures, to add, of Steve Puntolillo? Do you just want to say "Hello!"? Please feel free to Share it, here!